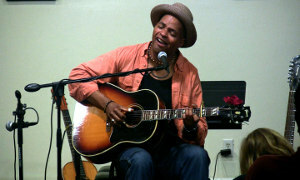 Guy Davis is a blues guitarist and banjo player, actor, and musician. Davis taught himself the guitar and learned by listening to and watching other musicians. One night on a train from Boston to New York he picked up finger picking from a nine-fingered guitar player. His first exposure to the blues was at a summer camp in Vermont run by Pete Seeger's brother John Seeger, where he learned how to play the 5-string banjo. Throughout his career, he has dedicated himself to reviving the traditions of acoustic blues and bringing them to as many ears as possible. His influences are as varied as the days. Musically, he enjoyed such great blues musicians as Blind Willie McTell, Skip James, Manse Lipscomb, Mississippi John Hurt, Elizabeth Cotton, and Buddy Guy, among others. It was through Taj Mahal that he found his way to the old time blues. He also loved such diverse musicians as Fats Waller and Harry Belafonte. Easily the proudest recording project Guy's been involved with is the one produced by his friend Larry Long, called "I Will Be Your Friend: Songs and Activities for Young Peacemakers", in which Guy contributes the title track. It's a CD collection of enriching songs combined together with a teacher's aide kit to help teach diversity and understanding. It is all part of the national "Teaching Tolerance" campaign and continues to be distributed by the Southern Poverty Law Center, and sent to every public school in the country to help combat hatred. And speaking of children's projects, Guy wrote a couple songs and recorded with Dr. John for Whoopi Goldberg's "Littleburg" series, and appeared and sang in "Jack's Big Show", both for the Nickelodeon network, "Nick, Jr". Guy has also done residency programs for the Lincoln Center Institute, the Kennedy Center, the State Theatre in New Jersey, and works with "Young Audiences of NJ". 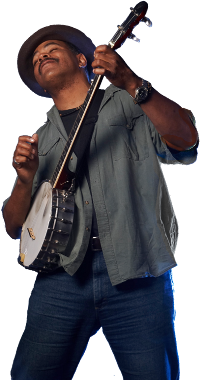 We are honored to have Guy Davis as our Guest Artist for the 36th Annual Alaska Folk Festival.